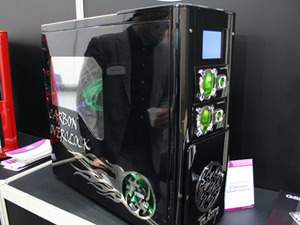 CeBIT 09: Paul from Coolercases, and Tom from Snailmods had their Cooler Master artwork out for all to see at CeBIT this year. To be honest, I had no idea they’d finished them (I should have followed the project logs closer) but from speaking to Tom it sounded like the work wasn't done until the last minute, meaning CeBIT was the grand unveiling for these mods. 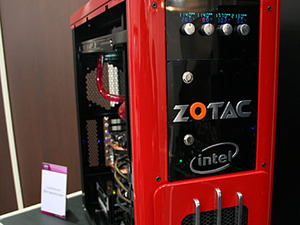 Paul's case (the red one) has two out of the three Zotac watercooled GTX 295s in Europe inside (the third being shown on the Zotac stand itself) and, just like the Skulltrail mod that was part of last year’s Mod of the Year competition, this Core i7 Smackover setup boasts professional build quality in cable management and its dual loop red and black watercooled design. The Carbon Overclock made by Tom is a buffed up ATCS 840 with a little less on the outside – the subtle customisation looks good and goes well with the flares of green. OK, so it’s not the most elaborate and crazy mod on earth, but given the time constraints to get it finished for CeBIT, the build quality is exceptional. We've organised with Paul and Tom to get coverage of the builds on bit-tech very soon so you'll soon see how they came to be, but in the meantime drop into our project log forum to get your fill of many awesome mods. Happy birthday to us, happy birthday to us! Mod of the Month is celebrating its first birthday this month! And to celebrate, we're giving away a present to one lucky modder. Read on to find out who it could be this month! 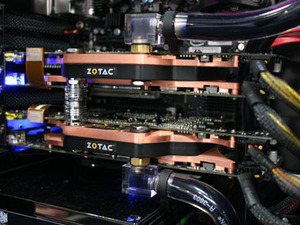 There are very few things about watercooling that are misunderstood more than the waterblock. After all, how does it really work? And what makes a good block? We take a look at the anatomy of a waterblock and even give you some tips for if you want to build your own. The winner of July's Mod of the Month has been chosen, and so have the prizes for August! 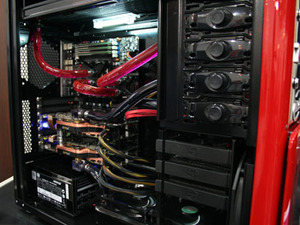 So get in, take a look, and get back to modding.